According to the authoritative judges of the Boat Builder Awards for Business Achievement, Paolo Vitelli's name is synonymous worldwide with Italy's highest production and innovation capacity in the nautical sector. For the first time in nautical history, the careers and contributions of leading nautical entrepreneurs over the last 50 years were measured against one another under the auspices of the prestigious IBI (International Boat Industry) magazine and of Amsterdam’s METS, the world's largest marine equipment trade show. The qualified jury, made up of nine journalists and industry experts called on to evaluate the candidates of the first ever "Boat Builder Awards for Business Achievement", granted the "Lifetime Achievement Award" to Paolo Vitelli, founder and president of the Azimut|Benetti Group, a world-leading Italian company in the production of mega yachts. Paolo Vitelli thanked the jury, IBI and METS for the detailed and flattering review of his own personal milestones and those of Azimut|Benetti. In his speech, he pointed out that, in order to be an entrepreneur, you need a dream, a driving passion and a firm commitment, as well as a pinch of positive madness, the latter having being his most crucial quality in tackling the great challenges that have earned the company its present day success. The president of the Italian group also directed an encouraging exhortation to young people, now that markets seem to be recovering, inviting them to take on even greater professional challenges than his, without the fear of 'daring'. In its many years of challenging, hard work since 1969, Azimut|Benetti has introduced countless corporate and product innovations, many of which have become veritable turning points, paving the way for and dictating new technical, strategic and commercial trends soon adopted by the rest of the industry. Just to name a few, the company is responsible for introducing the use of fibreglass for boats over 30 meters in length; for being the first to pioneer and believe in the US market, in which it currently boasts a solid and widespread presence; and for internationalizing the Italian Azimut|Benetti brand, ensuring its steady growth and turning it into the undisputed industry leader. Today, the driving force behind the company's success is the father-daughter team made up of Paolo and Giovanna Vitelli. Over 250 people, including VIPs and representatives of the exhibiting and winning companies, took part in the first prize-giving gala evening, which took place in the spectacular glass-roofed garden of the Maritime Museum in Amsterdam as part of METS 2015 (Marine Equipment Trade Show). Bavaria Yachtbau with strong teams on a growth path All the signs point to continued growth for Bavaria Yachtbau. Due to the very good order intake from the autumn boat shows in Europe, the US and Asia all production lines at Bavaria are busy. This requires not only new recruits for the production section but also in the sales, marketing, finance and development departments as Bavaria strengthens the existing teams with new members. Jürgen Scholz joins Bavaria as the new Head of Sales. The management expert will strengthen the development of the international dealer network and the strategic adjustment of the new-customers business. Bavaria has more than 100 dealers in 52 countries and will deliver more than 1.200 yachts this year worldwide. Thorben Will is the new Head of Marketing at Bavaria. His first task will be the organization of the upcoming boat shows, especially the boot Düsseldorf in January. For the first time Bavaria will display all their catamarans, sailing and motorboats in one stand called Bavaria World in hall 17. That means 18 yachts on a 3.500 square meter booth. As Head of Program Management, Alexander Berg will be responsible for the whole development process of sailing and motor yachts from the first drawing to market introduction. 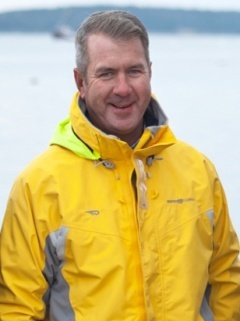 Alexander has over twenty years experience in the marine industry as a surveyor and manager of a shipyard. Because of the growing demand for financing or leasing of yachts, Bavaria set up a new department. Martin Bijl now supports the worldwide dealer network in all questions regarding financing and leasing in the new Service Customer Financing. 5,000 meetings within three days more exhibitors, more visitors, more meetings, more deals. With this simple formula one could summarize the success of the second edition of the CharterExpo. From the 23rd to the 25th of November charter enterprisers, agencies, investors and decision-makers met in Berlin at the probably biggest B2B exhibition in Europe of the charter industry. In 5,000 meetings over three days not only old contacts were maintained and new contacts separately attached, also very concrete deals for the charter season 2016 were closed. The CharterExpo was organized by the biggest shipyard of Germany for yachts named Bavaria Yachtsand the worldwide biggest reservation system of yacht chartering Yachtbooker. Horizon Yachts is pleased to announce the 2016 Horizon Open House will be hosted March 10th-13th, 2016 at the Horizon City Marina which is located alomgside the 2016 Taiwan International Boat Show at the Kaohsiung Exhibition Center in downtown Kaohsiung, Taiwan. Horizon plans to showcase four luxury yachts at Horizon City Marina for Open House event, an E84 motoryacht, E56motoryacht, and two yachts specifically for the Taiwan market, as well as a display of three yachts at the 2016 Taiwan International Boat Show: the debuting FD85 fast displacement motoryacht, new RP120 superyacht, and the E56 motoryacht. The 2016 Horizon Open House is a biennial event that honors Horizon as one of the world’s leading luxury yacht builders. Along with the yacht showcase, the Horizon Open House will encompass shipyard factory tours, VVIP and VIP events, a Kaohsiung sight-seeing city tour, and more; the event is expected to draw more than 1,000 guests from around the world. In little over a year since its first debut, the innovative Italian yard, Invictus Yacht, has managed to establish their market presence as an example to follow in terms of quality, aesthetic research and performance elements that distinguish each of their boats. But the most important and encouraging prize come from the clients. The numbers speak clearly: one year after presentation and six months of sales, Invictus Yacht has already sold more than 50 boats in Italy, France, Spain, Serbia, Montenegro. Exceptional results, especially when you consider market conditions and fierce national and international competition. Moonen Shipyards in the Netherlands is making a strong recovery from the financial turbulence it faced earlier this year due to problems entirely beyond the yard’s control. Construction of one of the yard’s ongoing projects – a 30-metre motoryacht in Moonen’s new Caribbean range – has now recommenced in full cooperation with the owner, shareholder, subcontractors and suppliers. In addition, a number of other clients have submitted their yachts for refits as a sign of their support for Moonen. Moonen Shipyards has built many award-winning motoryachts over the decades but Saturday 14 November 2015 may well go down as one of the most pivotal moments in the yard’s distinguished history. As the hull and superstructure of the 30-metre motoryacht Matica were joined together, it symbolised the unity and determination to see the yard come out of its recent financial turmoil and regain its place as a leading exponent of premium quality yachts. The announcement of a ‘suspension of payment’ at Moonen in July 2015 shocked everyone in the superyacht industry. It came as a complete surprise as the yard had found a major new shareholder two years ago with significant financial clout in the form of Mexico’s largest steel manufacturer. AMHSA’s commitment to the future of Moonen was such that it had commissioned the first in a new and very well received range of semicustom motoryachts called the Caribbean series. The innovative nature of the Caribbean series is one of the many reasons why people were saddened to hear of the troubles at Moonen. The yard has a reputation for combining forward thinking design and technology with the traditional values of Dutch craftsmanship that are appreciated around the globe. The management and craftsmen at Moonen are also well-known for their hospitality and commitment to owner satisfaction, so the enforced suspension of payment had a personal impact on many. This warm heart towards Moonen has also been its saving grace at this vital moment in the yard’s history, as Bilterijst explains. The Matica yacht is slated for launching in July 2016. And the confidence shown by the owner that Moonen will complete the build has been mirrored by very practical support from several other clients who have submitted their Moonen superyachts for refits at the yard. These include the Moonen 97 Etoile d’Azur and the Moonen 97 Nimbus, both of which are being given a new exterior paint livery, having modifications made to their interiors, and enjoying a range of technical upgrades and maintenance. Delivery of both yachts is planned for the spring of 2016. The management team are now working towards solutions that will enable the suspension of payment to be lifted. Sea Ray announced the launch of a newly revamped Sea Ray Owners Club during a successful VIP Event held on opening night of the Fort Lauderdale International Boat Show. At the party on Thursday evening—during which Sea Ray also debuted two new yacht models, the 400 Sundancer and 400 Fly. President Tim Schiek addressed the large group of Sea Ray customers, dealers and executives in attendance. The mission of the new Sea Ray Owners Club is to Celebrate, Connect and Empower owners in a whole new way. In addition to these engaging local events, Sea Ray is also launching a new online community. Benefits available through the Sea Ray Owners Club include free on-water and on-road towing coverage from NBOA; discounts on concierge services, dockage and fuel from MarinaLife; exclusive savings from grilling and cooktops manufacturer Kenyon International; fuel credits from The Out Islands of The Bahamas; hotel discounts from the InterContinental Hotels Group; and many more. 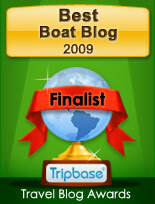 From now through January, the Sea Ray Owners Club Online Community will be in beta testing phase. Owners are encouraged to register and log their feedback in the “ideas” section of the site. FLIBS was the occasion to follow up top brokerage houses and discuss the potential opportunities to position Tankoa Yachts as a contender to bid on new construction for their clients. Considering the extremely high interest for Tankoa as a builder, it has been decided to create a “FCP business unit”, FCP standing for Fully Custom Projects. This new unit will benefit from the yard’s now impressive hull platform collections of 50, 53, 55, 58, 60, 65, 71, 80 and 88 meter to adapt them to clients’ own projects created by a designer of their choice. This new unit will also be handled by a cohesive collaboration between Yacht-Ology together with Tankoa’s expertise Euro Contenti (CEO), Edoardo Ratto (G.M) and Renzo Chelazzi (S.M. ), whose technical knowledge is limitless. Yacht-Ology has already received massive interests from brokers on this end. M/YGrace E by Vitruvius Yachts has been awarded the Best Power Yacht in the 65m+ category at the International Superyacht Society Design Awards 2015, which took place on the eve of the Fort Lauderdale International Boat Show. The category featured a number of high- profile superyachts alongside Grace E, each from prestigious yards and designers; but she continued her winning streak of 2015 with another victory. The peer-reviewed ISS Design Awards are judged by leading naval architects and designers in the industry, and this year celebrated was the competition’s 25th anniversary. The judges commented that some of Grace E’s winning factors include her efficient hull form and timeless exterior and interior styling as well as the planning and emphasis on world cruising that went into her design, keeping the environment in mind. The third motor-yacht built from Philippe Briand’s designs for Vitruvius Yachts, in 2014 the 73m Grace E was delivered to her owners at the Picchiotti shipyard in La Spezia. The flagship vessel has since received widespread acclaim from the yachting community, and has been bestowed with numerous industry awards. Earlier this year, she won Best Motor Yacht Under 75m and Motor Yacht of the Year categories at the World Superyacht Awards, as well as a trio of Showboats Design Awards for exterior design and styling, naval architecture and environmental protection. Grace E was designed with innovation in mind across her five decks, not least below the water’s surface in her patented Briand Optimized Hull shape. This advanced naval architecture, combined with her diesel-electric propulsion, maximizes efficiency to provide an enviable cruising range of 7,500nm. Her interior includes a dedicated wellness deck and cleverly configured guest suites that can be conjoined via moving walls. Vitruvius Yachts has recently announced a number of new projects, including an 80m yacht to be built at Turquoise Yachts, a 60m yacht to be built in Northern Europe and 105m collaborative project with Oceanco. Although all designs for Vitruvius Yachts are unique, they follow a familiar theme and defined signature ‘look’, with specific attention to balance, efficiency and robustness in their design. The first sea trial on board the Wider 150, project “Genesi”, was undertaken on the 12th of November; weather conditions were good and sea state calm. The Wider technical team were joined on board by specialists from Veth, who were on hand to analyse the performance of the azimuthal pods that provide thrust, along with technicians from Emerson Industrial Automation who were eager to see the power management system working under the actual conditions it was designed for. 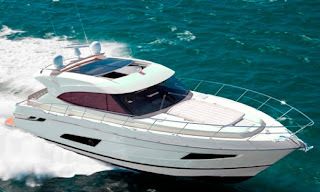 Largest private owned and World famous Italian builder Azimut Yachts presents its new virtual showroom with a website. 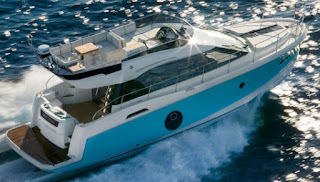 Head quartered in Italy Turin, with other construction sites located in Viareggio, and Brazil, Azimut continues to make innovation in design of the yachts its priority. Founded by still the current owner in 1969 by Paolo Vitelli, it first started up as a sailing charter company, later on it became a yachts dealer agent, and 1975 marks the humble beginnings of Azimut the yacht builder with the AZ43 Bali, followed two years later by the 32 Targa. 1982 is the start of innovation with the launch of the 105 Failaka biggest fiberglass build of the time launched in Viareggio, 1988 the brand challenges the Blue Riband with the Azimut Atlantic Challenger, and in 1993 the 78 Ultra starts the frame less glass windows concept on its yachts. Other important recent milestones are also the launch of the 68S in 2003 marking a return to the Sports segment which today has a range from 40 up to 120 feet, and most recently the dual mode hull semi displacement 74 Magellano in 2009 which entered Azimut in the Explorer yacht category. Azimut current line up has seven collections; Flybridge, S, Magellano, Atlantis, Grande, Brazilian, and Dragon series which start from 34 feet and go up to 120 totaling 28 models. Azimut's new website is available in Italian, English, Portugese, Chinese, Spanish, and Russian languages. 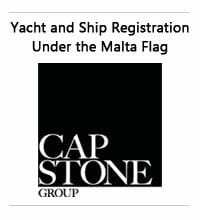 The new website buttons are; Menu, which opens up the following navigation buttons; Flybridge Collection, S Collection, Magellano Collection, Atlantis Collection, Grande Collection, Brazilian Range, Dragon Series, Find the right Yacht for you, My Azimut, About Azimut, Dealers Network, Authorized Services, Second Hand Selection, Job Opportunities, Contacts, and Reserved Areas. Azimut has also its social media pages on Facebook, Twitter, Youtube, and Itunes with a link at the right top of the page. Currently in build at Filippetti is a new F93 model with a launch date for mid 2016. The Filippetti F93 is a design to renowned Italian designer Fulvio de Simoni. For this new model the F93 will follow the footsteps of the F76, which was a resounding success for Filippetti about a decade ago, thanks to the innovative fore deck dinette on a motor yacht of 23 meters. The F93 will feature classic modern Italian yacht lines with a flybridge giving a very interesting sporty hiding appearance. The interior layout will offer four double guest cabins, while at midships will be a crew lobby which also will feature the yachts galley, a small dinette, and two cabins. Power options for the F93 will come from a standard 1948hp MTU with shaft line, and a unique option for a flybridge motor yacht of twin 2600hp and Arnesons surface drives. This speed enthusiast option will give top speeds up to 45 knots. Introduced in late 2010 the Cruisers 48 Cantius has been a resounding success for the North American. Wisconsin boat builder. It was the first step of a range the Cantius which now totals four models, including the 2015 launched new 60 flagship. For 2015 the 48 Cantius has been added with a new light colored wenge wood option for the fitting out of the interior. This new fitting out option will stand along the appreciated standard walnut wood finish, giving the future owner a further choice in building his 48 Cantius to his vision. The 48 Cantius is also available with a host of other options like four hull color choices; white, black, blue, and a slate grey, and a propulsion choice of the tried and tested line shaft or IPS pod drives. The Board of Directors and the employees of the Hinckley Company mourn the passing of their friend and Chief Executive Officer, James P. McManus. Jim was appointed to the role in June of 2007 and was often heard to call it his dream job. He worked tirelessly to see the company through its darkest times in 2008-9, and led the company to the extraordinary heights it has reached in recent years. Never boastful or arrogant, Jim was the consummate optimist finding the best in everything and bringing out the best in all of those he touched. Jim was instrumental in attracting new investment to Hinckley in 2010. The company developed and launched a series of five highly successful new models and acquired Hunt Yachts in 2013 under Jim’s leadership. Hinckley today is very much a part of the Jim McManus legacy. A native from New Englandr, Jim was a graduate of Yale and Harvard Business School. He worked in corporate finance with Lehman Brothers and management consulting with McKinsey and Company. While at the Aramark Corporation, he served successively as President of three operating divisions and later served as President and CEO of the Zoots Corporation. He was an avid boater who loved to spend weekends aboard his Hinckley Talaria 44. Jim resided in Charlestown and Hyannis, Massachusetts. He is survived by his wife, three children, his parents, sisters and a legion of friends and colleagues who cherished him. Jim passed away after a brave and unflagging battle with cancer. Marlow continues to upgrade its entry level Mainship range with the introduction of a new 34 model project. As all the other new Mainships the new 34 follows Down-east lobster cruiser lines and is a design to David Marlow. The new Mainship 34 is all about practicality offering a double dinette layout in a one step split cockpit, with a free aft deck looking for a fisherman cruiser type client. 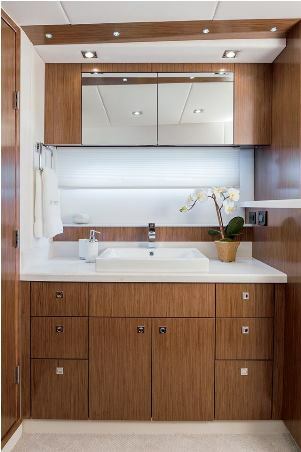 Below the Mainship 34 offers a separate owners cabin to fore, C-shape dinette to starboard, a compact but practical L-shape galley, and a complete shower head to port side. Power comes from a single 320hp Yanmar diesel engine with Marlow patented Velocijet propulsion. Founded in 2010 it is an interesting short story so far that of Wider and it's founder Tilli Antonelli. who reaches a new stop and starts a new departure with the new 150. The first Wider 150 is something very different of what is usually found in the market thanks to its innovative diesel electric propulsion system and a forward engine room. The first Wider 150 thinks ship like propulsion in a smaller 46 meter package. If this this has been done in small size ships I do not know, but for a yacht of this size it is surely a first. But apart the technical innovation the Wider 150 is also a sleek looking super yacht with substance, with looks by Fulvio de Simoni, full displacement bulbous hull shape, aluminum 5093 construction, and a range of 4200 nautical miles at 11 knots. Hatteras President John W. S. Ward announced a brand new model during a press conference at the 2015 Fort Lauderdale International Boat Show: the 90 Motor Yacht. This stylish, contemporary yacht is designed to be consistent with the other models in the builder’s Motor Yacht line, including the Hatteras 100 Raised Pilothouse and the 70 Motor Yacht. The 90 Motor Yacht has a flush main deck with a flexible interior arrangement. The layout places the galley forward along with a casual seating and dining area, while the formal dining table and salon lie aft. An optional arrangement moves the galley to amidships and the dining table aft, creating a unique salon forward that benefits from the extra privacy afforded by this location.The main deck windows are large and frame-less, maximizing views of the water around the yacht. The Hatteras design team also created optional fold-out balconies for the main deck that are incorporated into the bulwarks, offering guests a further connection between vessel and sea. The lower-deck guest area has four staterooms, all with en suite heads, accommodating eight guests in comfort and privacy. The crew quarters, aft of the engine room, can be accessed from the yacht’s transom and also from a discrete door on the aft deck. Outdoor entertaining is maximized on the 90 Motor Yacht, which has a large aft deck settee and dining table. The foredeck also holds a settee, cocktail table and a large sun pad; an optional layout includes fore and aft-facing benches served by a table. When it comes to entertaining guests, the expansive flybridge on the 90 Motor Yacht also is sure to be a popular spot. In addition to the fully equipped helm station, which is shaded by a hardtop on the Open version, the flybridge holds a dining table for eight, a long settee and a bar. The new 90 Motor Yacht is scheduled to debut at the 2017 Miami boat show. Down-under company Whitehaven presents its new virtual web show room. Whitehaven is a new company founded in 2014 by Keith Hanson and son Ryan, who are partnered by entrepreneur Bruce Scott. Whitehaven are built in Taiwan, at the New Ocean Yachts shipyard. But the design of the product is dedicated to the down under market. The company debuted in 2014 with the release of the 6000 Flybridge, followed soon after by the 6000 Coupe in early 2015. The current Whitehaven range offers a total of eight models which start from the three 60 feet versions of the 6000 series and end up to a 950 Super Yacht model still in concept. Whitehaven new website takes you around with the following buttons; Home, Whitehaven Range, Video, News, Join Whitehaven, and Contact. Whitehaven also features its social media pages on Facebook, and Instagram with a link on the top right. Set to launch in early 2016 at the Miami show, the 5400 Sport Yacht is the latest addition to Riviera's collection A replacement to the 5000 Sport Yacht, the Riviera team has created an entirely fresh design with a sleek new profile along with stylish hull windows and portholes, recessed for enhanced protection and aesthetic appeal. You will also notice that key design cues have been taken from the latest Sport Yacht model, the 6000 which has enjoyed considerable international success since her launch. The 5400 genuinely abounds with spaciousness and this can only be fully appreciated when you step aboard. At once you will notice a vast array of new features, especially the sheer magnitude of the 5400’s internal volume. She will offer a three double cabin layout with midships located full beam owners room. Riviera will also offer an alternative two cabins layout with the third bunk cabin to port side, replaced by an L-shaped lounge. Power will come from twin Volvo 626hp engine with IPS pod propulsion. Always requested since the stop production of the 34 Zaffiro, and not so well received 36, Cranchi presents the new Z35. A model which on paper has all the credentials to be a success for the well known Italian boat builder. The Z35 unlike the 36 does one simple important detail, to do not reinvent the wheel. Still the Z35 improves in important features, we see a flash single floor main deck, and the most wanted today hull side windows, and a large bathing platform aft. The interior of the Z35 is again a simple but very workable layout in this size with the usual forward owners cabin, twin berths at midships, and saloon, head and galley in between. Power will come from twin Volvo 260hp stern drive engines. It was always a question of when for Pershing to present a new flagship. The Pershing 140 comes again from the hands of designer Fulvio de Simoni. Apart this she will have a couple firsts for the Adriatic sea based shipyard; most important is that she will be built in alloy at Ferretti Group's sister company CRN Ancona facilities, and that it's bow will be of the vertical design type. The Pershing 140 will be full of technical innovations and even though De Simoni went for a two and a half deck design the semi wide body hides the second deck pretty well, making the raised pilot house appear as the main deck. The 140 will also feature the stern stanchions, as the much acclaimed 70. Pershing's 140 will be available in various speed configurations subject to engine and propulsion systems with the Ferretti Group engineering department advising a wide range of 30 to fifty knots max speeds. Maxi Dolphin is an Italian custom yacht builder which presents its new updated Internet web showroom. 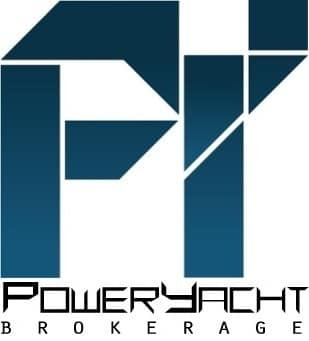 Founded in 1987 in Brescia Italy, it started by building one off racing sailing yachts for high demanding clients. Its first launch was Carmen Di Bellavista, a 73 feet maxi sailing yacht designed by Bruce Farr to race in the ICAYA circuit. In 2007 came the presentation of its power sport yacht range with the introduction of the beautiful Studio Starkel designed MD51 Power. The MD51 is followed by the MD53 Power, what is a sloop stern version of the 51, and the project of the MD65 which is still awaiting its first owner. Maxi Dolphin has so far delivered a total of over three hundred boats designed by World Class designers Bruce Farr, German Frers, Luca Brenta, Roberto Starkel, Bill Tripp, Ettore Santarelli, and Jean Marie Finot. 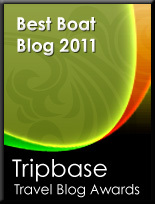 The following tabs guide you through the site: Home, Motoryacht, Sailing Yacht, Brokerage, Boatyard, Press Area, and Contacts. Maxi Doplhin also features its social media pages Facebook, Twitter, and Youtube with link buttons located on the top right of the page. It's been one of the most awaited news since the beginning of 2015, when the Gavio Group, who also owns Baglietto and Cerri acquired the Bertram brand. What was Gavio going to do with the company? At first came a press release that the only interest Gavio has is to return Bertram into the echelons of sport-fishing. It was a waiting time and after months asking questions, here comes the answer from Bertram, Gavio, and designer Micheal Peters. This team made an unsuspecting choice of recreating the legend of Bertram and re-offer the 31 into a new 35 format. Yes that 31 which sold over one thousand units in a production run of twenty or so years, and a classic boat since its launch. From a certain point of view it was a very interesting choice, and also a challenging one at that. Today unlike the pioneering days of the 31, this size market is mostly dominated by fast triple or quadruple powered center consoles. But this some might say could also be a blessing in disguise, since the Bertram 35 which currently is under construction at Lynn Morse will have not much competition. Design wise infect its main competitor will only be the Ocean Yachts 37 Billfish. It will be interesting times, and wishing Bertram the best of returns, since without this name, there is a missing protagonist not only in sportfishing but all the motor boating industry. Featuring an overall length of 45 feet, the Monte Carlo MC4 launched in the first part of 2015 is the starting model into the upmarket motor range from the Beneteau Group. Just as all the bigger Monte Carlo, the MC4 is a design to renowned designers duo Nuvolari and Lenard. The MC4 will offer a large two cabins layout below deck with a galley and living on the main deck. Very spacious in the MC4 will be the large full beam owners room located at midships. The flybridge is another spacious affair offering a large C-shaped settee to port side, and helm station and wet bar to starboard. Power from the MC4 comes from twin Volvo 370hp with IPS pod propulsion. The number 88 in the Oriental culture is considered the luckiest of all numbers. The owners of the newest model in the Marlow Explorer line up, the 88 ise indeed lucky to have benefit of all that Marlow Yachts has learned of composite and mechanical engineering. This yacht is expected to deliver speeds in the 30 knots range with the large engine options, exceeding speed of many yachts this size despite having 20% smaller engines. This lofty goal was made possible by extensive experience in the 80 Marlows and continuing development work on underwater and superstructure drag reduction. The 88 Explorer will offer accommodation for four double cabins which include a full beam midships owners cabin. Two cabins aft will sleep four and share a well sized shower head. Standard power comes from twin Cummins 715hp. Long range economic runs at 8 knots will deliver runs of 4200 nautical miles. Astondoa has presented on its website the project for a new 62 Coupe model. So far Astondoa is showing minimum details of this upcoming model. What can be seen from the above rendering is a sport yacht with an axe bow, and a hard top covered center console. Contrary to its name the new Astondoa Coupe seems to be a very open model. We will see if the feelings of the rendering will be confirmed when the model is launched. Evo Yachts is a fresh new brand part of the Sea Engineering Group who also owns Blue Martin, and Blue Ice names. The Evo 43 was the boat that stole the show at the 2015 Cannes and Genoa events. 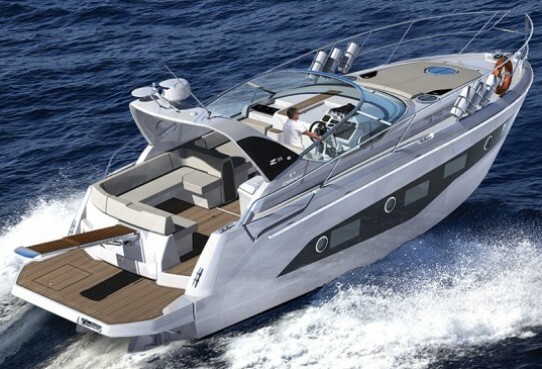 Not surprisingly so, the stern of the 43 Evo is innovation at its best, and a new meaning to transformation. It transforms and look different thanks to the full opening for both sides and stern, doubling the space of the area. Styling wise the designers of the Evo 43, Studio Rivellini went to straight out minimal style with a bit of homage to the fore bearer of this design, the famous Wally Power 118, see engine intakes. Interior wise the Evo will sleep four persons in a convertible dinette forward, and a double cabin at midships. Power for the Evo 43 is from twin Volvo 435hp with IPS pod drives which give a top speed up to 38 knots. It is has been a very interesting market in the last five years or so in the upper echelons of European production motor boat building. Saying it simple, new players have arrived, and others while still having a good name in the market lost the power of the brand they once had. For example Beneteau Group have showed that they where much more then a mere spectator, the Montecarlo range has grown from strong to stronger, in the meantime the French giant also upgraded Prestige to the upper side of the market. Polish Galeon have also increased its market share focusing on all around quality and innovative range, not only in its larger sizes but from its thirty feet 300 series model. Absolute has been another growing player, and fair to say the Italian brand has always focused on the upper side of the market with a look into making price per value a very important part of it's strategy. Absolute was also very clever as it is was a builder which fully focused on the advantage of IPS in regards to offering more space on it's boats, and that alone is why the sub fifty feet Absolute are among the most spacious boats in there respective size. These names will be paramount in the years to come, and in a certain sense will offer a competitive future of quality production boat building; along the other known names of Azimut, Fairline, Ferretti Group, Princess, Sessa, and Sunseeker.